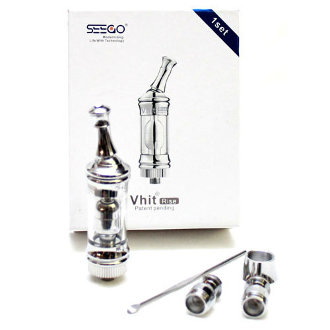 The Vhit Rise Clearomizer for Wax is a top of the line clearomizer that has far and away surpassed other wax burners in this category. The Rise produces Hugh amounts of vapor and also the flavor is amazing. Thanks to its innovative design, it eliminates obstructions and misfires. It has a Pyrex glass tank and features a chrome steel body. Also, not only does this clearomizer provide you with the potential to exchange the coil heads, it may be completely disassembled. This enables for thorough cleansing and maintenance. It's 510 threaded and can work on any eGo battery. Remove the base from the bottom of the clearomizer by unscrewing. Replace base by screwing it back onto the bottom of the clearomizer. Unscrew the coil head and replace with a new one. For best results, please apply appropriate amount thick oil/herbal wax, do not overload the coil. Overloading will cause irreparable damage to the coil. To prolong the life of the tank, disassemble the clearomizer and clean on a regular basis.